Home on Alice Court. Image: LPC. Positive hearing for 36-building residential enclave near Atlantic Avenue. 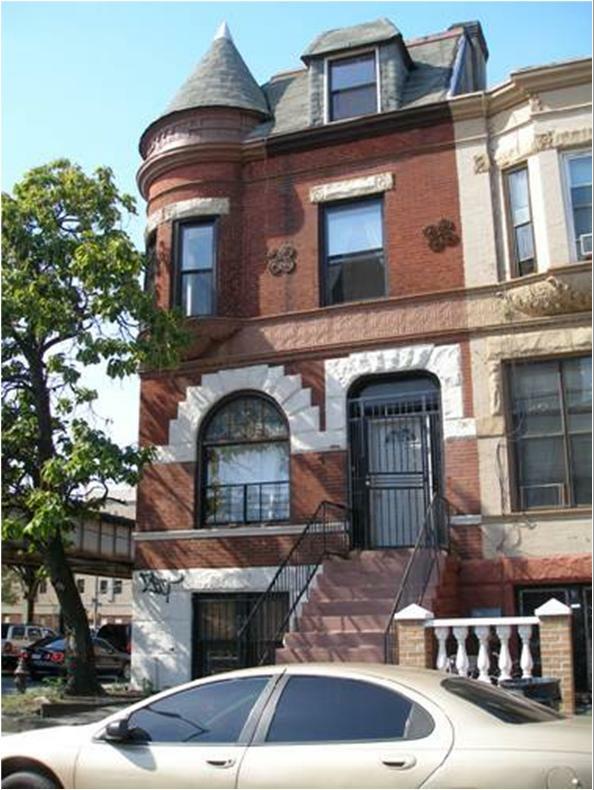 On September 16, 2008, Landmarks heard testimony regarding the potential historic district designation of Alice and Agate Courts in Bedford- Stuyvesant, Brooklyn. Comprised of two cul-de-sacs off Atlantic Avenue between Kingston and Albany Avenues, the neighborhood was developed by Swiss-born Florian Grosjean, owner of a successful kitchenware company. Grosjean named Alice Court after his daughter while Agate Court refers to the imitation agate kitchen utensils his company manufactured. The Courts’ architect, William M. Coots, built the 36 rowhouses out of brick and stone in the Queen Anne style, with stained-glass transoms, rock-faced stoops and lintels, and, on the anchor buildings, full-height round corner bays. Several residents of the Courts attended the hearing to testify in support of designation. Collectively, they spoke of the sense of community the Courts created. Resident Marlene Christian thanked the commission for considering “a working class area,” while homeowner Melvin McCrae testified to the amount of original fabric and details that still exist. support of designation. Collectively, they spoke of the sense of community the Courts created. Resident Marlene Christian thanked the commission for considering “a working class area,” while homeowner Melvin McCrae testified to the amount of original fabric and details that still exist. Though the Commission did not discuss designation at the hearing, Chair Robert B. Tierney stated that Council member Al Vann, who represents the district, strongly supported designation. LPC: Alice and Agate Courts Hist. Dist., Brooklyn (LP-2309) (Sept. 16, 2008).